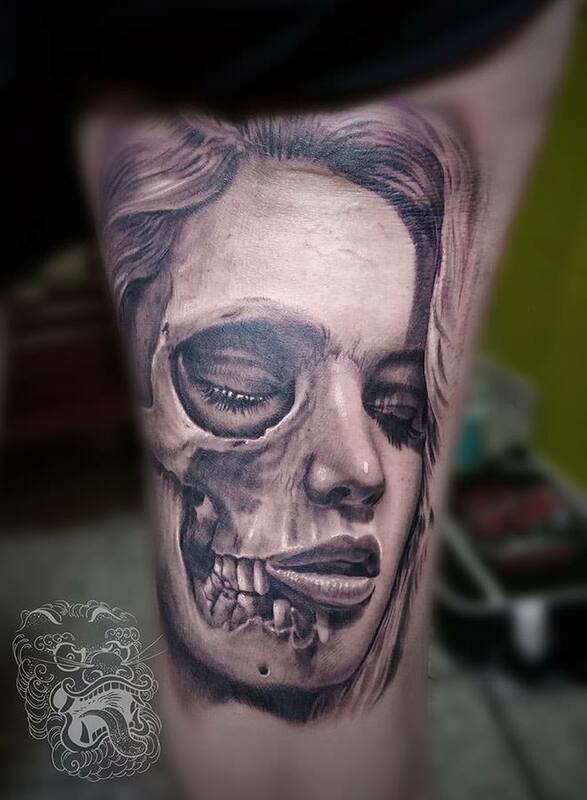 Dia De Muertos — Malan - Top Realism Tattoo Artist working from Germany, Neuwied. Or Day of the Dead in English it is a Mexican event, where people meet to celebrate and remember, talk about family and friends that passed away. Skeleton motive in Mexican art is a traditional one. Roots of its usage go deeply into Aztec times. La Catrina - skull makeup idea became tremendously popular, and became part of western culture, as a Halloween face paint idea, or as a tattoo symbol. La Catrina tattoo I did on the back of the thigh. Color La Catrina tattoo. This design I did, proves how deeply ingrained is now this type of design in western culture. We use it as a design element, fantastic idea, but death part doesn't have to be so intense anymore. 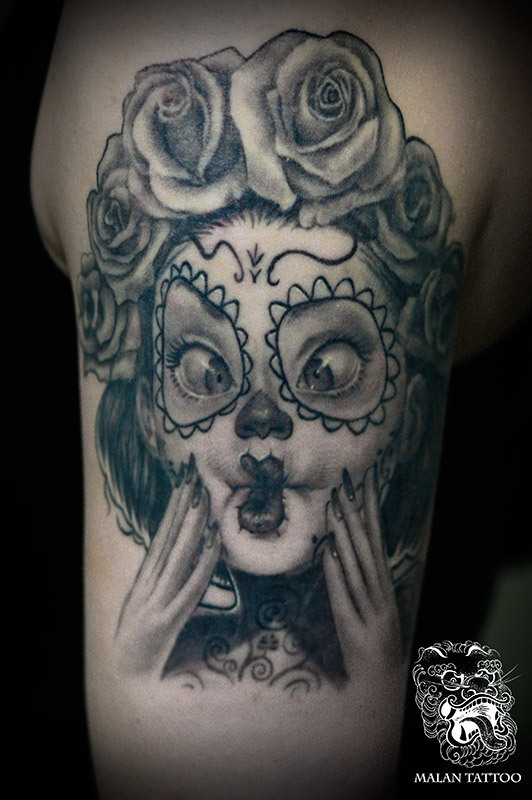 La Catrina tattoo became popular because, in my opinion, it joins perfectly what we appreciate in tattooing. It is easy to fill with personal meaning, it has beauty elements, and also has a dark side. Tattoos that show two sides of a human character, or represent two worlds: living and dead; were always part of the body modification culture. La Catrina is such a broad concept that anyone can find the approach, that will satisfy him. In this one, customer requested the copy of traditional artist piece. Tattoo above I planned for my customer from scratch, according to her needs. One of the requests was to use blue color as a highlighter. Should one go with color or black and grey? What is the better option for La Catrina? It is really more of the personal preference. I feel that color ones are always a bit more positive, respond better to Mexican culture, while black and grey ones lean towards more darker, creepy designs. The picture above and the following image, are part of the same man's arm and were done with approx.2 years time difference. Relations with my customers are friendly ones, and we find out meeting each other in the following years. Long-term cooperation creates the unique bond between artist and the collector. In La Catrina, I enjoy showing dead elements and depicting them realistically. For ornamental parts I keep them to the absolutely needed minimum, as if overused, they have a tendency to break the gentle beauty of a female face. Tattoo above shows one of my favorite methods of approaching eyes.